Five years cooperation, we have been know each otehr very well, and still make more cooperation to make greater success! Thank you for Mr Zhuang business cooperation and take me to learn more about local Xiamen, culture in China. Thanks for Mr Ben Zhuang returned our money $20000.0 immediately, our accountant sent wrongly. It is save to work with this guy and his company! We work together to design new product image, design sales promotion solutions, fiannly we win more business scope in motorcycle bearings. Amazing! 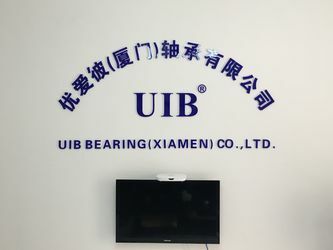 UIB (Xiamen) Bearing Co.,ltd. 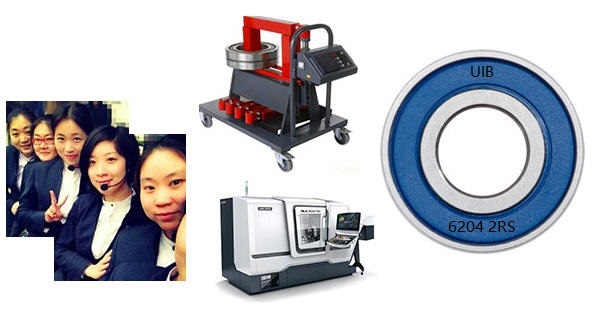 has been one of the professional bearings manufacturer and machinery parts exporter in China since 2015. Our technical manager has been working in bearing since 2007. Our sales manager for different markets such as Asia, Europe, the Middle East, South Africa and South America. Currently, our hot products include ball bearings, roller bearings, agriculture bearings, wheel bearings, truck bearings, auto parts, construction equipment and agriculture machinery parts. We can also manufacture and supply bearings and parts according customer's samples or drawings with special sizes. Engaged in export for more than eight years, our products has been sold to the US, Canada, Germany, France, Mexico, Brazil, Argentina, Venezuela, Peru, Singapore, Thailand, South Africa and the UAE (Dubai). We have been cooperating with buyers such as auto bearings distributor (Mexico), agriculture equipment (Austria/France), sliding door system (South Africa), bearings wholesalers (Peru), steel manufacturers (Canada), motors manufacturer (Brazil) and other industry areas. 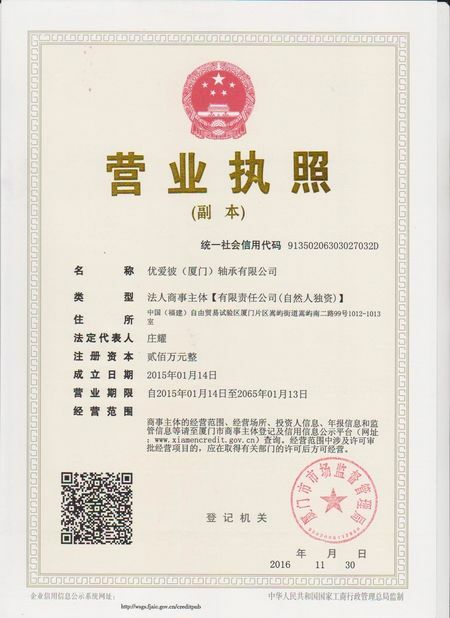 Quality guaranteed: Our company has passed ISO certification. Strict Quality control system. 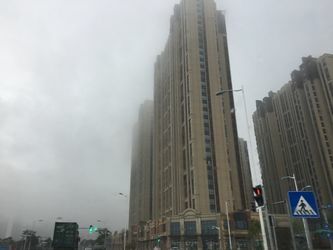 Fast delivery advantage: With large stock bearing, we can deliver our products within four to seven days. 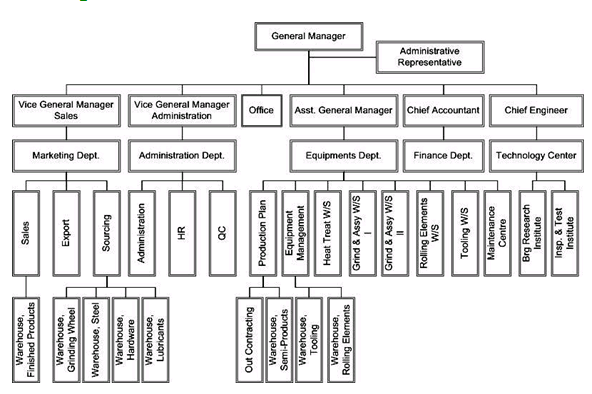 We have three to four R&D personnel, with over six to seven years’ working experience. Furthermore, with their help, you can get your free samples in six to seven days. Our foreign trade staff consists of six English-, Japanese- and German-speaking personnel with four to five years of experience. Orders start at 1 piece. 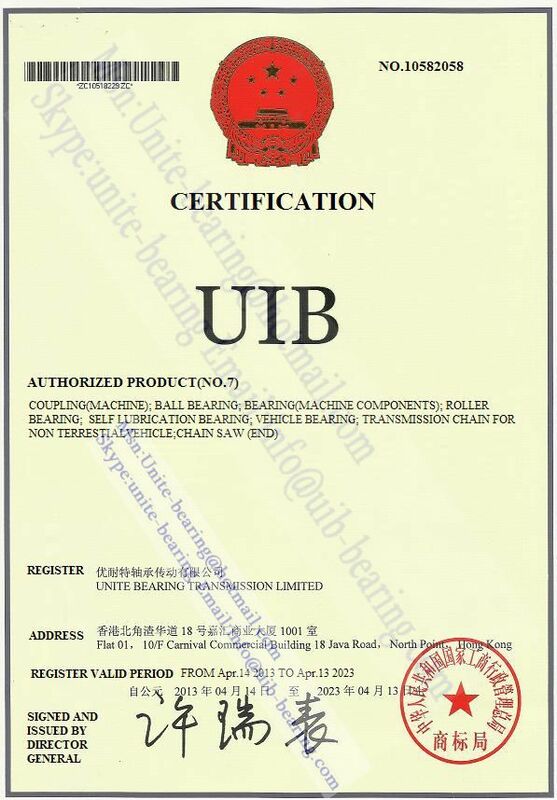 Our Brand UIB meaning: Ultra Ideal Bearing solution! 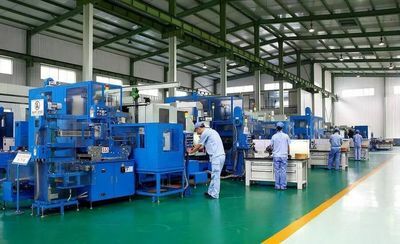 Our factory engaged in DGBB (deep groove ball bearing) on 2007, technical manager has been worked in C&U,and continuous using the same working process as C&U production line. 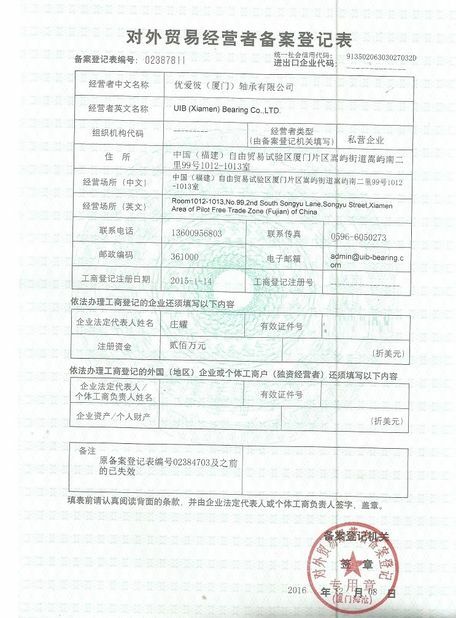 Our quality for 6204, 6205, 6304 have been accept by C&U lab test and approved to be ZV3, P5 (ABEC-5) Grade. These bearings reach on EMQ quality, and are popular in China motor manufacturers and electric bike factories. 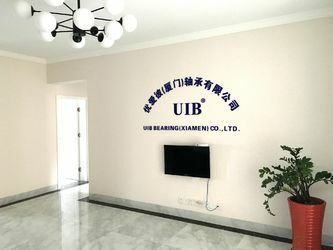 For better service to our overseas customers and trade in convenient, we have registered our company Unite Bearing Transmission Limited on Hongkong on 2010, and our brand registered is "UIB" which means "Ultra Ideal Bearing" solutions, or "Universal Industrial Business". 1, high precision ball bearing, which is quality quite guaranteed to be used in motors, motorcycle wheel bearing, conveyor rollers. 2,Pillow block bearing, using housing material from HT180, HT200, cast steel C45, UC insert bearing grade ZV1,ZV2 could be used in industrial fan, which require high speed movement. 3, Spherical roller bearing, all types of cage, MB, MBK, CC, CA, E,etc. 5,Other transmission parts we source for our customers. Contain,sprocket, roller chain,pulley,chain coupings. We provide bearing solution for customers! Our advantage product range: Pillow block, High precision ball and roller bearing, Sphericall roller bearing! EMQ motor, Reducer, Motorcycle parts, Heavy duty construction machines, Mining industry, Conveyor transmission system, etc. PBQ: For premium bearing quality. ZBY: Top high quality level. LIPKA: Agriculture bearings, agriculture machine.